A little parcel fell through my letterbox yesterday. It landed with a squeak on the doormat. I picked it up and carried it into my kitchen and unpacked it carefully. As I took off the last bit of sticky tape I could hear a little chuckle. Inside were several little packages. When I opened the last little package I heard a sigh of relief. Yes - you guessed - Flat Susan with all her bits and bobs! Cathryn had sent a beautiful tag for me - there are so many clever crafters out there aren't there? Thanks Cathryn - I will put in my WOYWW tag book along with all my other special tags. Also there seemed to be lots of other bits and bobs for me to check over so I will tell you more about those later. Flat Susan was so pleased to be out of the parcel and quickly settled into the home that had been specially put ready for her arrival. I think she liked the facilities but I did hear her mutter that things seem a little old fashioned out here in the Welsh Marches! 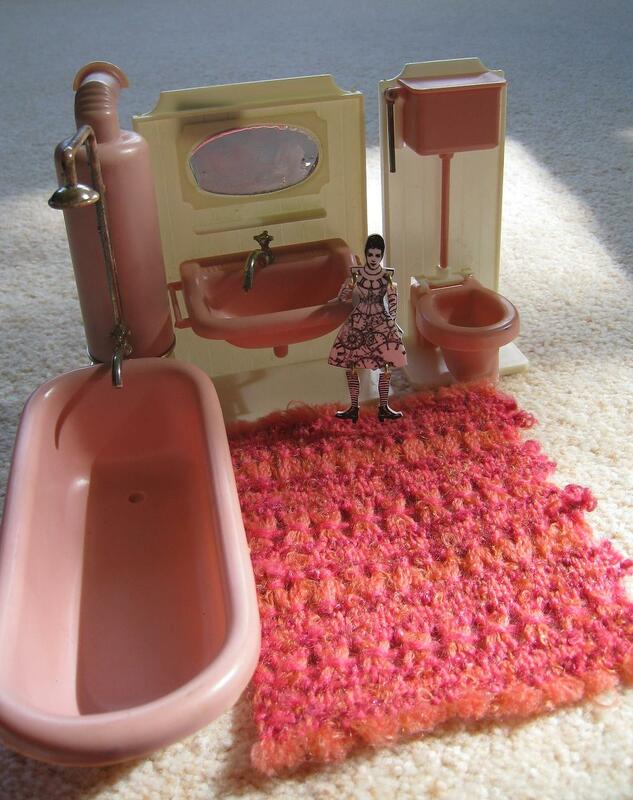 She loved her little pink bathroom and couldn't wait to take a long relaxing bath to soothe her aching bones after her long journey. 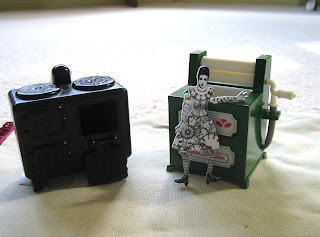 However her kitchen facilities and laundry equipment certainly left a lot to be desired. She will ony be here for a week so I bet she saves all her washing tor Annie to do next week when she moves on to her! She was delighted to see her cosy little sitting room, complete with a sewing machine all set up ready for her to join in with the crafty activities that take place regularly here. I hope she will be very comfy. I am sure she will enjoy all we do this week. Pop back later and see what she gets up to. Great to see Flat Susan again, I've kind of lost track (must head to her blog to catch up!) Hope she has some fun times with you. Looks like she has settled in well but don't think for one minute that you will send her on to me with all her washing....trust me when I say I have plenty here to keep me busy. I'm really hoping she will come ready to pull her weight and help me out with my chores. Truly tremendous Jo - thank you so much. I doubt she will want to leave as you have made her so comfortable. Aha! So FS is with you and looks like she is settling in very nicely indeed! 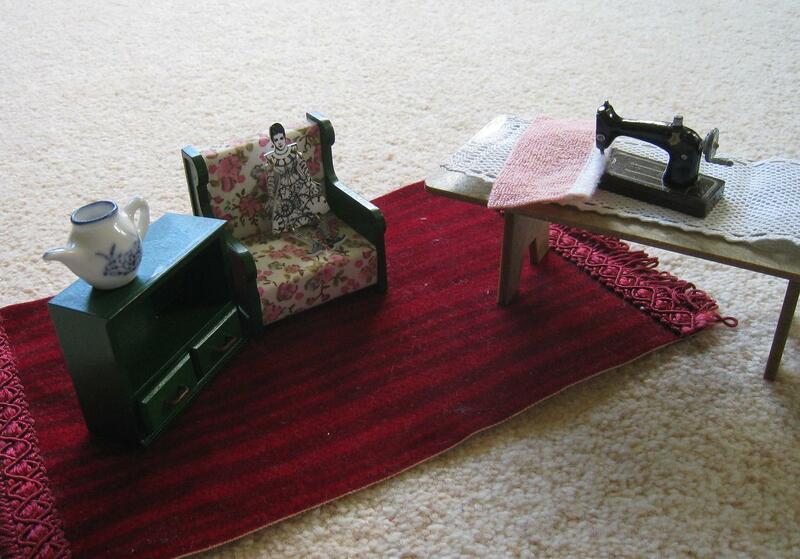 Love all the furniture and stuff you have for her and that little sewing machine is a gem indeed! What a lovely tag you got too... blimey, that raises the bar a bit... better get my thinking cap on ready for when I have to do one! She's so tiny! and I love all the set ups you arranged for her.... wow..she's spoiled at your place!